The scene of the crash on Wednesday. “We intend to find out not only what happened, but we want to find out why it happened,” said National Transportation Safety Board vice chairman Robert Sumwalt. The train’s black-box recorders have been recovered, and investigators will also be looking at track-signal recorders, aerial footage, and the wreckage itself. The NTSB’s on-site investigation is expected to take five to seven days, while the full inquiry will conclude in about a year. Here’s what we know: At around 6:30 p.m., a packed Wassaic-bound train slammed into a Mercedes SUV that had become stuck on a railroad crossing on Valhalla’s Commerce Street, causing a huge explosion. Five passengers were killed, as was the SUV’s driver, and at least 15 others were injured. 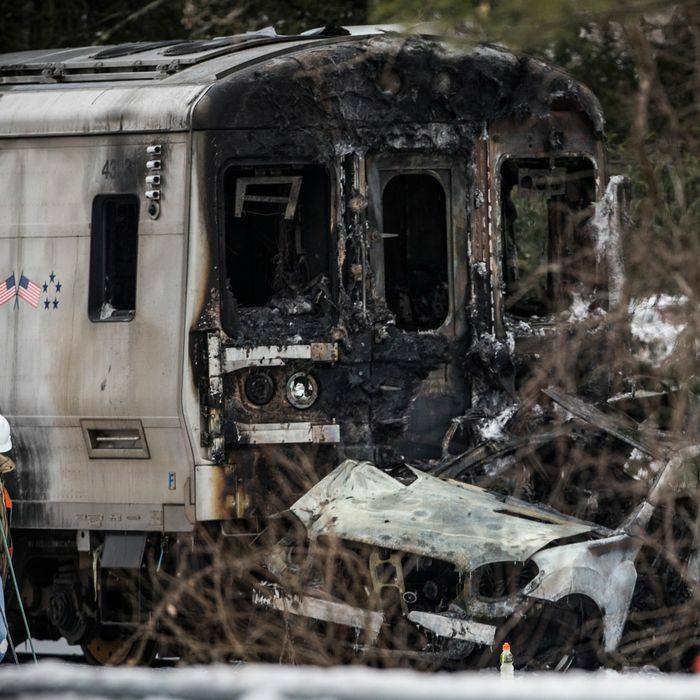 It was the deadliest incident in the history of the Metro-North. It seems that the SUV driver, identified as Ellen Brody, got confused and panicked after the crossing’s wooden safety gate came down on her car as the train approached. “It looks like [from] where she stopped she did not want to go on the tracks, but the proximity of the gate to her car, you know, it was dark — maybe she didn’t know she was in front of the gate,” Rick Hope, who said he was directly behind Brody, told WNYW. Authorities said the impact of Tuesday’s crash was so powerful the electrified third rail came up and pierced the train, and Cuomo said the SUV’s gas tank apparently exploded, starting a fire that consumed the SUV and the train’s first car, which was left blackened and mangled, its roof twisted sideways. The SUV, pushed about 400 feet, looked as though it was stuck on the front of the train. Anthony Bottalico, the chairman of a Metro-North union, told the Times that the operator hit the emergency brakes as soon as he noticed the Mercedes. “He did everything he was supposed to do,” Bottalico said. “He hung in there as long as he could” before becoming overcome by smoke. He survived, but remains hospitalized. The train’s first car filled with smoke and fire, and “people started falling over each other” to escape, passenger Chris Gross told Good Morning America. “It’s life or death at this point,” he said, recalling how a man with burned hands managed to open an emergency exit. Meanwhile, it took people seated farther away from the impact some time to realize that there was a serious problem, and many calmly filed out of the back. When the smell of gas reached them, they began wrestling with the emergency windows. One passenger, Elizabeth Bordiga, told the AP that she and the people around her were unable to escape until firefighters arrived to open a door. Of those who didn’t make it out, Westchester County executive Rob Astorino said that “all but one of the bodies was charred beyond recognition.” While the medical examiner is fairly sure of who they are, official identification will take a little while.